New Gwadar International Airport will be another green-field airport with all modern facilities for safe operations, passenger comfort and convenience. Construction New Gwadar International Airport is likely to start off in March 2018 and will be completed in thirty-six months after construction project commencement. * Soil testing is being conducted at New Gwadar International Airport construction site. The soil testing will be completed in February. 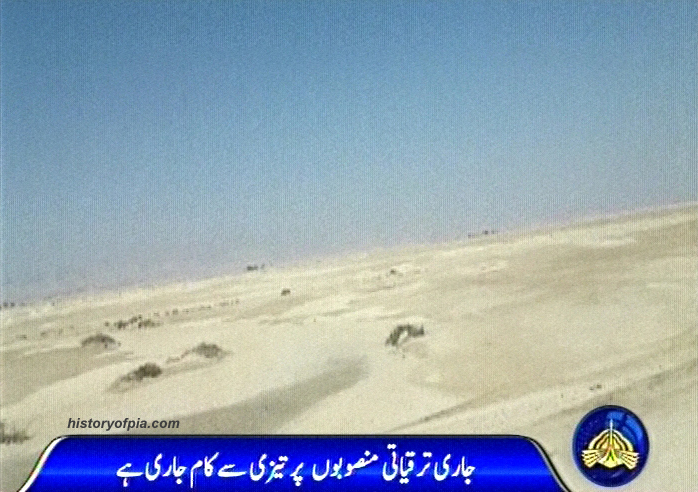 * Design of New Gwadar International Airport will be completed by the end of April. * New Gwadar International Airport project will be completed in three years when its construction work begins. 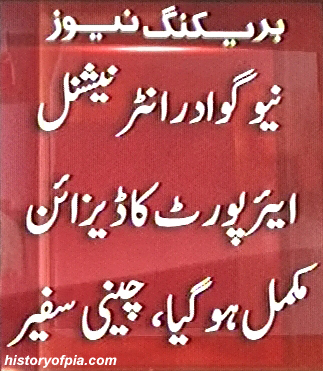 * New Gwadar International Airport will cover an area of 4,300 acres. * One million passengers will benefit from New Gwadar International Airport annually. * The New Gwadar International Airport project will cost 26 billion rupees, according to an initial estimate. * New Gwadar International Airport is part of China Pakistan Economic Corridor (CEPEC). 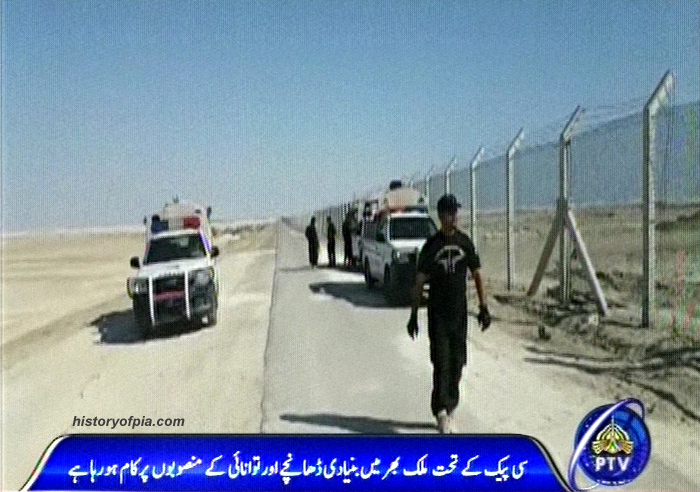 Site with perimeter fence for the construction of New Gwadar International Airport shown on PTV News. Groundbreaking/foundation stone-laying ceremony for new Gwadar International Air Port (GIAP) will be performed this month (April), according to a local newspaper report. ISLAMABAD: The federal government has allocated Rs 1800 million for the New Gwadar International Airport. 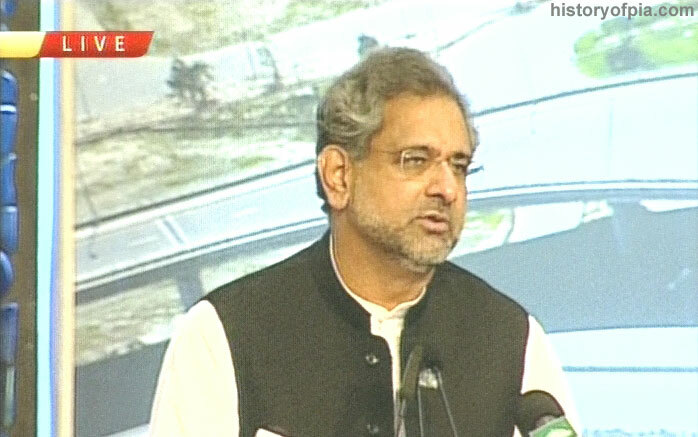 New Gwadar International Airport project is going through final designing and planning process and the project will start this month, said Prime Minister Shahid Khaqan Abbasi at new Islamabad International Airport inauguration ceremony today. New Gwadar International Airport construction work will start in third or fourth quarter of 2018. This was stated by Prime Minister Shahid Khaqan Abbasi at ceremony arranged for inauguration of expanded terminal building of Peshawar Airport today. Artist's impression of new Gwadar International Airport terminal building. Design of new Gwadar International Airport has been completed, said Acting Chinese Ambassador to Pakistan Zhao Lijian at a seminar in Islamabad today. Work on the project will start this year, he said. Pakistan and China decided to further expedite development projects in Gwadar and to ensure groundbreaking of new Gwadar International Airport this year. Artist's impression of Gwadar International Airport terminal building. BEIJING - The work on the new international airport is likely to start in the first quarter of next year. Both the Chinese and Pakistani government were discussing the modalities to use the Chinese grant to implement these project, according to official sources on Sunday. All the initial work of the new airport including design and the feasibility study has already been finalized. It will be an airport of international standards capable of handling the largest of passenger planes, including Airbus A380 and is aimed at facilitating the movement of international investors and visitors. The Civil Aviation of Authority (CAA) has earmarked 3000 acres of land 26km northeast of the existing airport. The new airport will be given international status and operate under the open skies policy. In the meantime, there are plans at the existing airport to further facilitate the movement of wide-bodied aircraft. Pakistan and China have agreed to perform foundation stone laying ceremony and start work on the construction of new Gwadar International Airport within next three months. Decision has been taken to start to the construction of new Gwadar International Airport in March 2019. A meeting of China-Pakistan Economic Corridor (CPEC) Joint Cooperation Committee (JCC) agreed to initiate airport's construction work as soon as possible. Construction of the new airport will be completed in three years at a cost of two hundred sixty million dollars. Agreement has been reached for project's Chinese grant. PC-I of the already delayed project has been completed. China Airport Construction Corporation (CACC) will take part in airport's construction.